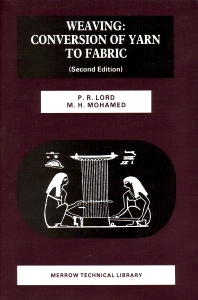 An historical introduction to weaving; A technical introduction to weaving; An introduction to weaving preparation; Winding; Warping; Slashing (warp sizing); Drawing-in and tying-in; The fundamental of fabric structure; Woven fabric design; The simple shuttle loom; Shedding and beating; Shuttle picking and checking; Automation and controls; Power, energy and vibration; Shuttleless weaving systems; More on shuttleless looms; Weaving room management. In this book, the authors consider not only the design and operation of the loom itself, but also the preparation of yarns and packages, the design and structure of the fabrics produced, and the management aspects of weaving as an industrial process. A comprehensive reference book covering in depth the modern technology of woven fabric production. It will be of value of the practitioner and student alike. The information provided will enable the reader to judge how to produce a fabric suited to a particular purpose in the most economical way. The text is generously illustrated and there is a glossary of terms which is cross-referenced to the text and to an extensive list of cited literature. Originally published by Merrow 2nd edition 1982.